sisu: "When you meet the pope, you cry"
"When you meet the pope, you cry"
He loves cats, he plays Mozart on the piano before he goes to bed at night and the dictatorial relativist Left is apoplectic. Halleluijah! 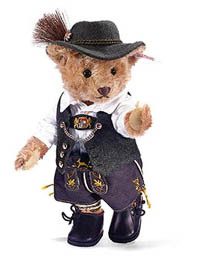 "Sissy, that Bavarian Bear -- it’s too adorable for words. 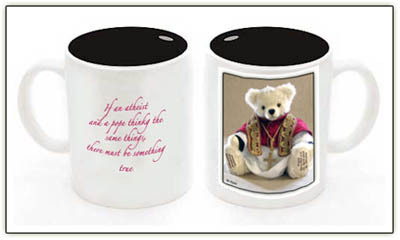 I want it," The Anchoress writes in her own comments re the Steiff teddy (above) from our previous post. [Benedict] is warm, pastoral, approachable, quite paternal, and as easy to glean as a dear old uncle sharing fellowship over a cup of tea. John Paul was a mighty pipe organ, dramatic, transcendent, soul-rattling -- almost overwhelming. He brought you to your knees, before God in hushed awe. Benedict is a piano being played by a musician who plays for love of the music, and he draws you into his sphere, to sing along in praise. He is so simple, the most humble priest I have met in my entire life. When he takes your hand, he puts it in his two hands. As Catholics, we know that he is the living representative of Christ on Earth. Can you imagine then sitting next to him? When I went to the piano, I was filled with so much emotion that my hands started to tremble. I never got that trembling before. For the first piece, I knew it was not me playing. People don't understand this. It's ecstasy, that's all . . .
"His music is by no means just entertainment," the pope once said of Mozart. "It contains the whole tragedy of human existence." In Benedict XVI, then, Sampietro has a musical soulmate. "Mozart is the angel of music"[says Sampietro]. His music brings you to the innermost part of the soul." The contrast between Papa Ratzi as a "dear old uncle sharing fellowship over a cup of tea" vs Barack Obama's lame protestations that HIS minister, the venomous Rev. Jeremiah Wright, is "like an old uncle who says things I don't always agree with" speaks volumes. Obama's snake oil of "hope and change" is thin gruel beside the deep, dark and delicious soul food of Pope Benedict's "Christ our hope." Thank God for Pope Benedict XVI - he is what this world needs right now. And I'll get to see him next week. How exciting! It really was amazing, to see the likes of CBS, NBC, ABC, NY TIMES, etc., try to push the dishonest conception that Catholics - Christians were looking for a more "LIBERAL" POPE ! Then their slanted representation of the newly selected Pope Benedict, truly sank to ugly lows. I suppose it works for the best in many ways, as the misleading portrayal of the very good, only enhances their story as they grow to shine. I was soooo ready to buy the mug, but when I went to Cafe Press all I saw was Baby stuff... Where's Papa???? Iris: I am in communication with the folks at Cafe Press, and as soon as things are up and running, I will let you know! Somehow, I was able to purchase three of them just after downloading the designs yesterday, but they never made it to my "store front." Sigh. Judeo-Christian values plus freedom from those who tell us what foolish interpretations of human nature we must believe are the salvation of Western Civilization.